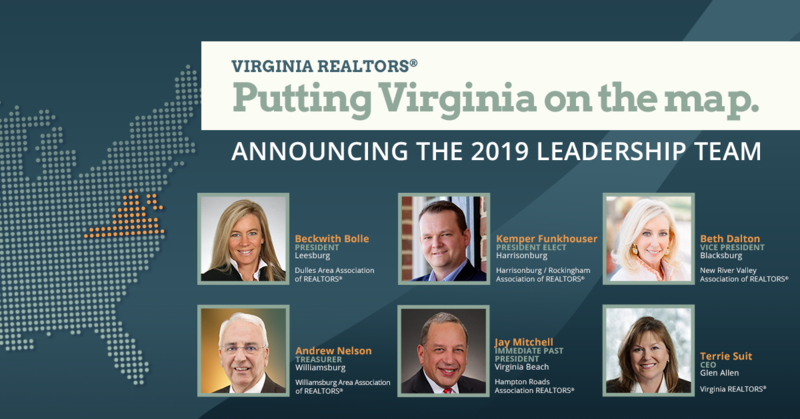 The time has come for the Virginia REALTORS® 2019 Leadership Team to take the helm. Beginning December 1, our new Leadership Team and State Board of Directors will begin their terms. Get to know those who will be serving YOU in 2019! Beckwith began her real estate career in 2004 at Coldwell Banker Residential Brokerage. She continued her success by moving to Carter Braxton Real Estate in 2008, earning her broker’s license in 2010 and opening Carter Braxton Preferred Properties in historic downtown Leesburg, Virginia the same year. She has won several awards from DAAR including 2010 REALTOR® of the Year, the Community Service Award, and she was also inducted into the DAAR Honor Society. Beckwith has been actively involved with the Dulles Area Association of REALTORS® (DAAR) since 2004, serving on and chairing the Governmental Affairs Committee, the RPAC Committee, and the DAAR Board of Directors where she served as the President of the Board in 2013. She has served on the Virginia REALTORS® Board of Directors since 2014. A long-time resident of Loudoun County, Beckwith currently resides in Leesburg. Kemper has nearly 20 years of experience in real estate marketing and brokerage, which includes a portfolio of residential and commercial properties throughout the Shenandoah Valley. As Chief Operating Officer and Supervising Broker of Funkhouser Real Estate Group, Kemper oversees all the company’s daily operational functions. Kemper was recognized by his peers as the local REALTOR® of the Year in 2009, having served as President of the Harrisonburg-Rockingham Association of REALTORS® (HRAR). A member of the Virginia REALTORS® Board of Directors since 2011, Kemper has also served on numerous state committees throughout the years, including serving as Chair of the Risk Management Committee and the Strategy Committee of the BOD. Kemper lives in Harrisonburg with his wife, son, and daughter. In his spare time, he enjoys playing golf with his son and traveling with his family. As Managing Broker for the Long and Foster Real Estate Blacksburg office, Beth has been deeply involved in the real estate world since obtaining her sales license in 2003 and her Associate Broker’s license in 2010. 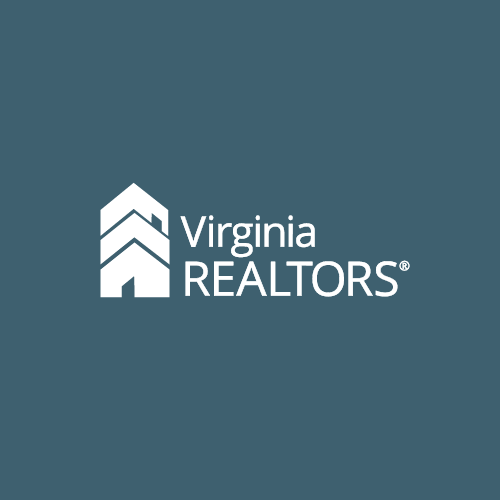 Beth has been a member of the Virginia REALTORS® Board of Directors since 2016. In addition to serving as Chair for the RPAC Fundraising Forum, Beth served on the Presidential Advisory Group as part of the RPAC State Fundraising Partnership Goal. A graduate of the National Association of REALTORS® Leadership Academy in 2016, Beth has been appointed to serve as a state representative to the NAR REALTOR® Party Member Involvement Committee until 2020. Beth resides in Radford where she enjoys being involved with the local Boy Scouts of America Blue Ridge Mountain Council and serves as a member of the City of Radford Recreation Commission and on the Radford University Alumni Volunteer/Student Recruitment committee. Andrew is the Associate Broker at Coldwell Banker Traditions in Williamsburg, having relocated to the United States from England in 2002 with a strong background in finance, banking, and human resources. A REALTOR® for more than 12 years, Andrew specializes in residential sales, relocation, and international real estate. An active member of the Williamsburg Area Association of REALTORS® (WAAR), Andrew has served as a director on the WAAR Board of Directors, then as secretary, president-elect, and its 2014 president. He has been a member of the Virginia REALTORS® Board of Directors since 2015. He has served on the Budget Committee of the Board, Awards Selection Committee, and was the Chair of the 2015 Virginia REALTORS® Annual Convention. Andrew lives in Williamsburg with his wife, Dorothy. He enjoys being active in his local church, playing a variety of musical instruments, and singing. Jay started his real estate career in 2004 with GSH Real Estate, now Berkshire Hathaway HomeServices Towne Realty. A broker since 2009, Jay leads three offices in the oceanfront area of Virginia Beach. He served as Virginia REALTORS® President in 2018 and has served as a member of the Board of Directors since 2013. He is the 2019 Vice Chair of NAR’s Consumer Communications Committee. A political junkie, Jay leads the NAR Federal Political Coordinator (FPC) team for Virginia’s U.S. Senator Tim Kaine and serves on the FPC team for U.S. Representative Bobby Scott. Previously, he served as the FPC team leader for U.S. Representative Glenn Nye. Jay’s community involvement is clear in his commitment to Rotary International, where he now marks 27 years as a member. Terrie was appointed as chief executive officer of Virginia REALTORS® in 2013. Terrie’s real estate background began in 1985 as a REALTOR® and later transitioned into a twenty-year mortgage lending career. In 1996, Terrie received a gubernatorial appointment to the Virginia Real Estate Board. Several years later she was elected to the Virginia House of Delegates where she served the 81st District for nearly a decade. During her time as a delegate, Terrie served as chair to the General Laws Committee, the Housing Sub-Committee, and the Virginia Housing Commission. In April of 2011, Terrie was appointed by Virginia’s Governor to be Virginia’s first Secretary of Veterans Affairs and Homeland Security. Terrie and her husband, Tom, reside in Stafford County. Working alongside our Leadership Team is a group of talented and dedicated REALTORS® from across the Commonwealth. Click here to see your complete Board of Directors list for 2019.